Providing support to large and small organizations alike. Unix(Solaris/AIX/HP-UX/BSD-OS), Linux(Red Hat/SuSE/Ubuntu/GOS) and Windows platforms as well as virtual solutions such as VMWare, Oracle OVM-Sparc (LDoms), Zones/Containers. IDS, IDP and Security Auditing Solutions - for ISS/IBM, Symantec, Altiris, BMC, BART, SELinux, Tripwire, Snort, Tiger, Logcheck, ManTrap and many other security products - new and old. Penetration Testing for internet insurance policies and risk/cost analysis. Designing and installing system and networking topologies using latest technology in system, network and telco solutions. Up to 24x7 Remote Service and Scheduled On-Call support. Outsourcing to support other consulting organizations. 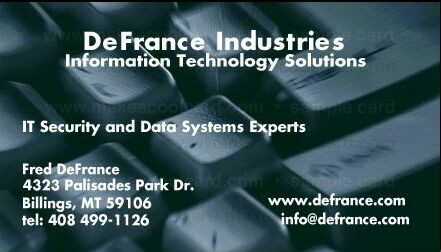 Copyright © 2009 DeFrance.com, DeFrance Consulting, and DeFrance Industries.